Carbon fiber veneer is all about the appearance of the carbon fiber. In a 3k weave, each strand consists of 3000 individual fibers. The fine appearance of these fibers is what gives carbon fiber its unique look. To produce a really beautiful veneer, you need to clearly show the fibers and the texture of the carbon. DragonPlate veneer is the highest quality, most beautiful veneer on the market. DragonPlate is manufactured by a proprietary process which produces a veneer with a crystal clear face. The veneer comes off the tool with the carbon fiber embedded in this optically clear surface layer with the fiber structure very clearly visible. We do not need to apply a secondary clear coat. Cheaper veneers are manufactured with simpler processes that do not produce this deep clear layer, so the carbon fiber appears flattened or crushed, the fine carbon fiber texture is not as well defined, and the surface is not as reflective. Traditional vacuum bagging processes and autoclaving prepreg simply cannot produce this finish. (on left) Cheap .010 thick twill veneer showing inadequate thickness of surface layer flattening the carbon fibers resulting in a 2-D appearance. (on right) DragonPlate twill veneer. Our deep epoxy surface layer develops the full depth and beauty of the carbon fiber structure preserving a 3-D appearance. 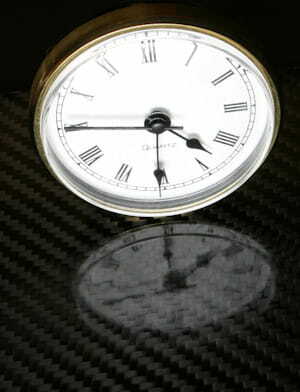 Autoclave prepreg does not show as clear a reflective image and the fine carbon fiber texture is not as clearly visible. 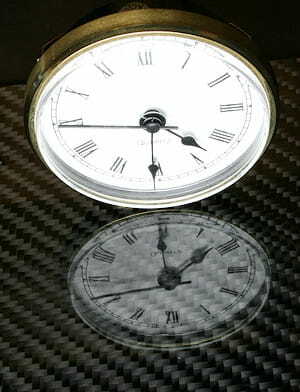 DragonPlate shows a crystal clear reflection superimposed on the clearly visible texture of the carbon fiber. As a result of our thick epoxy surface layer, the DragonPlate carbon fiber veneer laminate measures a full .018" thick compared to other paper-thin (.010") veneers. Unlike these cheaper veneers, DragonPlate can be applied over any color without the background showing through. DragonPlate carbon fiber veneer has a richer, deeper, and more lustrious appearance, and can be easily applied. Cheap thin twill veneer allows light to pass through. This allows appearance of substrate to show through. DragonPlate proprietary process blocks all light, eliminating the need to prepare substrate surface color and results in a more beautiful finish. DragonPlate Veneer is capable of forming to a cylindrical diameter as small as 1 inch! DragonPlate Carbon Fiber Veneer can be easily cut with shears or heavy scissors and can be sanded to produce a smooth edge. Our carbon fiber veneers come ready to install with contact cement; or for quick and easy installation, we optionally offer a veneer with high quality 3M self adhesive backing, already affixed. Simply peel and stick! Each carbon fiber sheet is available in standard gloss, scratch resistant matte, and texture finishes on one side, with a texture finish on the other side, creating an ideal bonding surface. Dragonplate veneer is available in a glossy finish and also a scratch resistant matte finish (see picture to left for comparison). If you’re going to spend money on carbon fiber veneer,why settle for anything less than the best! DragonPlate veneer is currently available in stock sizes up to 48 x 96 inches with custom sizes available upon quotation. Twill Weave Carbon Fiber Veneer 6" x 6"
Twill Weave Carbon Fiber Veneer 12" x 12"
Twill Weave Carbon Fiber Veneer 12" x 24"
Twill Weave Carbon Fiber Veneer 24" x 24"
Twill Weave Carbon Fiber Veneer 24" x 48"
Twill Weave Carbon Fiber Veneer 30" x 80"
Twill Weave Carbon Fiber Veneer 48" x 48"
Twill Weave Carbon Fiber Veneer 48" x 96"
Sheet Size: 24" x 48"
Sheet Size: 30" x 80"
Sheet Size: 48" x 48"
Sheet Size: 48" x 96"